What Good Is a Group? The occasional spark. The intentional fire. 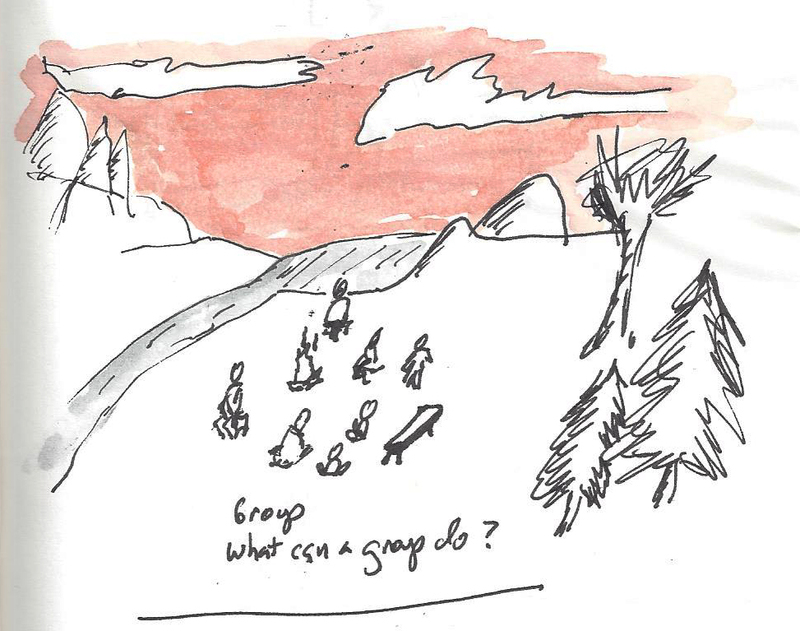 I’ve been wondering this lately: what good is a group? Mrs. Kirkistan and I lead a small group that regularly meets together to read ancient texts. At the moment we’re slowly going through Jesus’s Sermon on the Mount. It’s riveting stuff. There comes a time in the life of every small group where people start to bow out. Life gets in the way. Work, sickness, commitments and gradually the small group is, well, really small. Only a few show. Even so—with only one or two showing up—some magical spark can happen in the course of an ordinary conversation. We talked about the pointed words Jesus had to say about lust and adultery—old terms we don’t hear much in our culture—experiences so common they seem to be just expected parts of everyday life. In the course of hashing through those words, we talked about seeing people as objects. And suddenly I was making connections with Levinas and Buber and realizing I am also in need of reforming bad thought habits. These conversational sparks happen at work too. Yesterday I was lamenting to myself the ways large corporations dampen the enthusiasm of otherwise bright, motivated people. In the middle of that thought a client returned a call that we had cut short the day before. He had been thinking through our conversation and had five or six things to add. This client—from a very large corporation—had found a way to take personal ownership of the process and our discussion had a sort of breathless excitement to it. Our seemingly ordinary conversation had unearthed some live wire. And a group of us were doing our best to act on it. So—all this to say that groups can do things individuals cannot. And sometimes a group conversation can create something brand new. Our small group is reading an ancient text together. It’s reproduced in a contemporary volume and to my eye looks like the same English words and punctuation I might find in today’s StarTribune. But the prophet Amos is writing from a very different time and place. He was a shepherd back in the B.C.’s when kings ruled the peoples. And though he was (again) just a shepherd, he spoke a message that came from the God whose roar could wither a mountaintop and drop a pasture into mourning. John Walton, in his introduction to “The Lost World of Genesis One” (Downers Grove: IVP Academic, 2009) writes that understanding an ancient text is not a matter of translating the culture but entering that ancient culture—as much as possible. I picked up Walton’s book because I am fascinated by the huge task taken on by the writer of Genesis 1 and mirrored in John’s Gospel (John 1). Who doesn’t wonder how everything began? And this: what do those deep roots say about life today? Entering into Amos’ ancient culture will be our task. We’ll do it as a group. We’ll bring supporting sources and texts that point us toward that ancient culture as we walk through those nine chapters. We’ll look at how the author uses his words, what he repeats, what he emphasizes. How he frames his argument. We’ll take a bunch of conversational stabs at understanding the text and I expect to be deeply challenged about the ephemerals I fixate on. And…I’m expecting God to show up. I’m listening for that roar.